Thank you for joining us for the Pals Halloween Blog Hop. We hope you enjoy our virtual trick-or-treat hop where you will either learn great tricks for your creative projects or take a chance to enjoy a blog candy treat. You should have just left stop number 9 on the Pals Hop - Mary Fish at Stampin Pretty. If so, you are in the right spot. If you get off track, the full blog lineup below will help you move along from blog to blog so you see all of the amazing creations. Halloween is coming fast upon us. This month’s blog hop is sure to inspire you with some ideas for your own Halloween cards. I have eight and nine year old boys who were only too happy to cheer me on while I was creating this blog hop card! I drew the line when they suggested to draw blood dripping from the eye sockets. I was already nervous that it was too "outside the box" to share on my blog, but came to the conclusion – it is a Halloween card and it would be perfect for your favorite guy! This will be sent to my daughters’ favorite guy…hope you like it Scott! 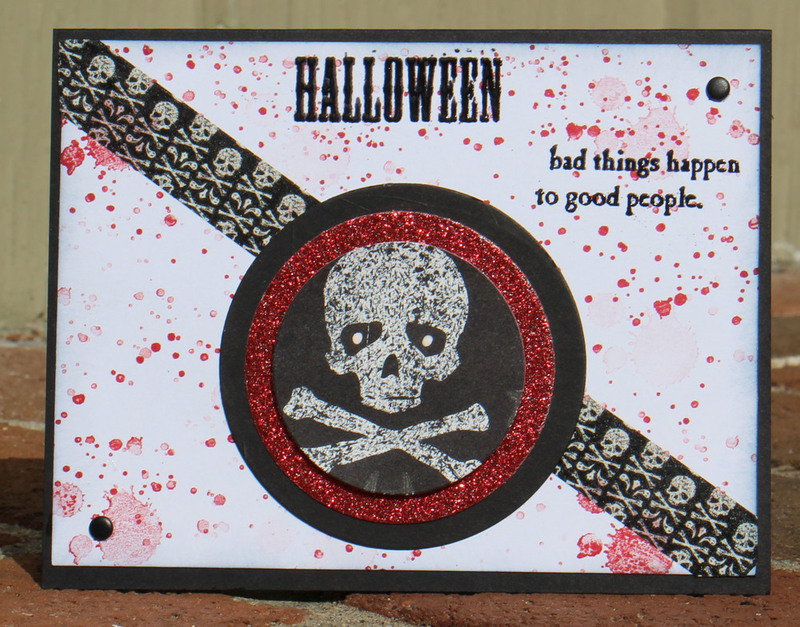 I used the Gorgeous Grunge stamp set to create the look of blood splatter, using Real Red on Whisper White cut at 5 ¼” x 4” and adhered to a Basic Black base card. Using the Real Red marker vs. the ink pad and stamping off a few times after each stamp, gave the effect I was striving for. HERE IS MY TRICK - ONLY EMBOSS OR INK PART OF THE STAMP TO CREATE A TOTALLY NEW LOOK! Next, only a portion of a stamp from the Halloween Bash set was embossed to read HALLOWEEN. I also embossed only a portion of a stamp from the So Sorry set. The word that was eliminated from the stamp that reads “that bad things happen to good people.” That changes the meaning of the intended saying on the stamp dramatically. A strip of the Witches’ Brew Designer Washi tape was placed across the card and topped with a black card stock circle, a red glimmer paper circle and the skull from the Witches’ Brew Designer paper cut into a circle. Basic Black candy dots on opposite corners and a white gel pen dot in the center of the eye sockets added the finishing touches to complete this card. If my card gives you the heebie jeebies, then I have accomplished my mission! Leave me a comment if you dare...your feedback is my inspiration!!! The next stop is Colleen Mollema at My Crafty Habit - stop number 11 on the Pals Blog Hop! Thanks for visiting – and I hope to see you next month! Posted on October 8, 2013 by Martie Pollard.